You are here: Home / Reviews / vBSEO Review – Is “Google SEO” Only Off-Page Optimization? SEO experts and especially Google SEO experts will always suggest working on off-page optimization factors more than on-page optimization for better organic ranking. C Programming Forum was something I never had the time to work on for quite some time until recently in the first week of September I started working on it. Upgraded vBulletin, then gave a whole new look, Installed vBSEO and other relevant plugins. After the new look I started with my marketing efforts and soon I saw traffic picking up. I thought the traffic was because of marketing efforts but to my surprise it was not only marketing that has worked in my favour. It was Google Organic Traffic that has tripled. 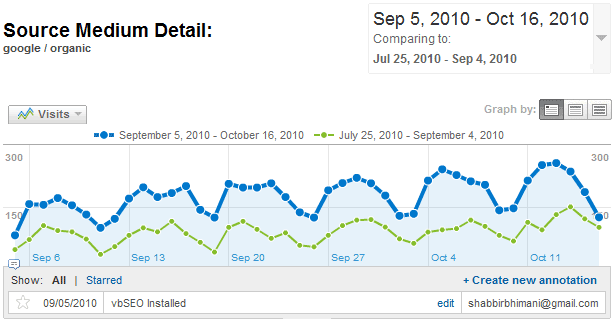 As you can see from the screenshot I installed vBSEO on 5th September 2010 and hours after installation my traffic from Google organic started to rise. Remember this is was one of those low traffic forums and yet I started to see results. Now let us see a day to day to comparison of Google Organic traffic keeping 5th of September as the pivot. You can clearly see the effect of vBSEO. So after looking at the charts finally my question is – Is “Google SEO” Only Off-Page Optimization? Share your views in comments below. Very useful data thank you. I love vbseo. Nice blog. I got a lot of good data. Iâ€™ve been following this technology for awhile. Itâ€™s interesting how it keeps changing, yet some of the core components remain the same. Have you seen much change since Google made their latest acquisition in the domain? May I suggest cleaning up your templates a bit? Yes nice suggestions and will look into it. vBSEO is a nice piece of software but it’s overpriced at $149. vBulletin 4.x has builtin SEO Friendly URLs and many other features of vBSEO can be obtained with modification in templates, if you know how to do that. I run two forums. One with vBSEO and the other one without it. My UVs per day is 10,500 without vbseo and 13,000 with vbseo. Pricing is a personal thing and I don’t think vBSEO 4 with just urls is anyway good for SEO. It is still not that stable product as well and so according to me SEO is still very far away from vB4. Just an example of how bad SEO is in vB4, they just recently addressed the issue of home page url which was being redirected to content.php without any reason. content.php is the default index page for CMS and this is a problem in vBulletin Publishing Suite only, not in legacy forum version. They already mentioned a temporary solution for that.. This was one of the biggest concern for SEO people. Let us say that your forum home page ranks well for some Keyword. Example go4expert.com home page ranks well for Programming forum and now when we have a temporary 301 redirect from home page to content.php URL my ranking can go down. Also all domain incoming links become of no use then because that page becomes a temporary redirect. Yes I know they had a patch for this but I guess this should not have been done in the first place if you are concerned about SEO and this is one such examples and I can give a lot more.